On this day, Gen. Sherman's flotilla of 60 steamers, loaded with troops and equipment, including Gen. George Morgan's Division and the 16th Ohio, sailed from the Mississippi up the Yazoo River about 12 miles. The large flotilla moored and disembarked troops over a two mile stretch of the Yazoo shoreline. At a place called Johnson's Plantation, near the mouth of Chickasaw Bayou, the 16th Ohio disembarked their boat and quickly took to the fields. 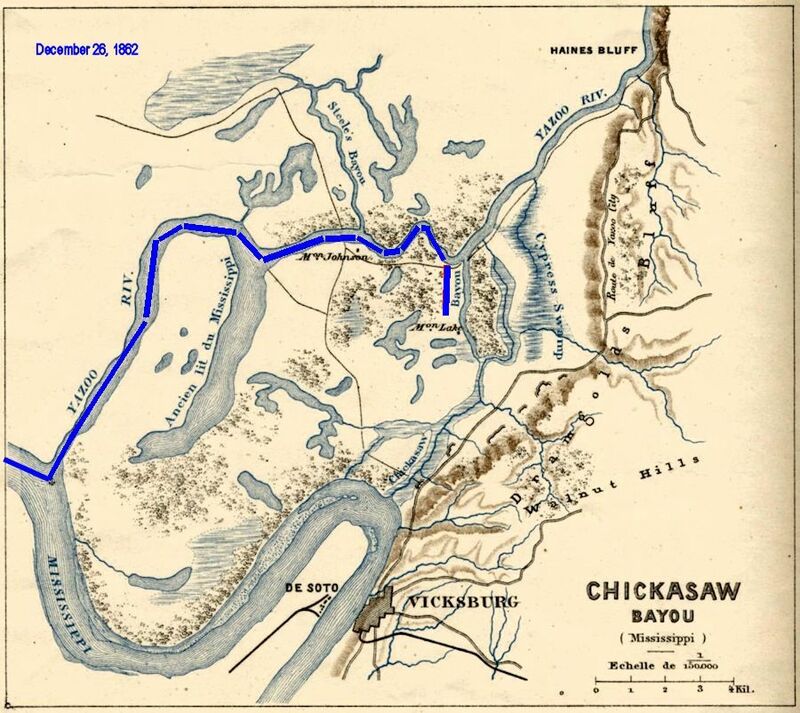 The 26th finds the troops landing on the south shore at a place called Johnson's Plantation, near a point where the Chickasaw Bayou connects with the Yazoo. A large field, covered with high burrweed and dead trees, bounded the Bayou on the west. On the opposite side was a dense forest. One of our gunboats, I think it was the Tyler, lay near the mouth of the Bayou. The 16th Ohio was in the extreme advance, and while they were landing, several shots were fired at the gunboats form the woods. A prompt response was sent back in the shape of a shell that exploded. A skirmish line was formed, and sent forward, to reconnoitre. Moving slowly back from the river, we picked our way through the troublesome weeds until we reached a more open region, the gunboat all the while pitching shells over our heads, and keeping it up until orders were sent back to them to cease firing. Some of the missiles, striking the tops of the dry trees, endangered the men below by the flying fragments of wood. Some of the enemy were encountered, and fired a few shots at us at long range near the plantation buildings. Nothing further, of much importance, occurred this day in our front. * Some information from Civil War Diaries and Selected Letters of Robert Newton Gorsuch, recently published in book form by Newt Gorsuch's great grandson, Everett Gorsuch Smith, Jr. The book is available for purchase from various Internet sources. 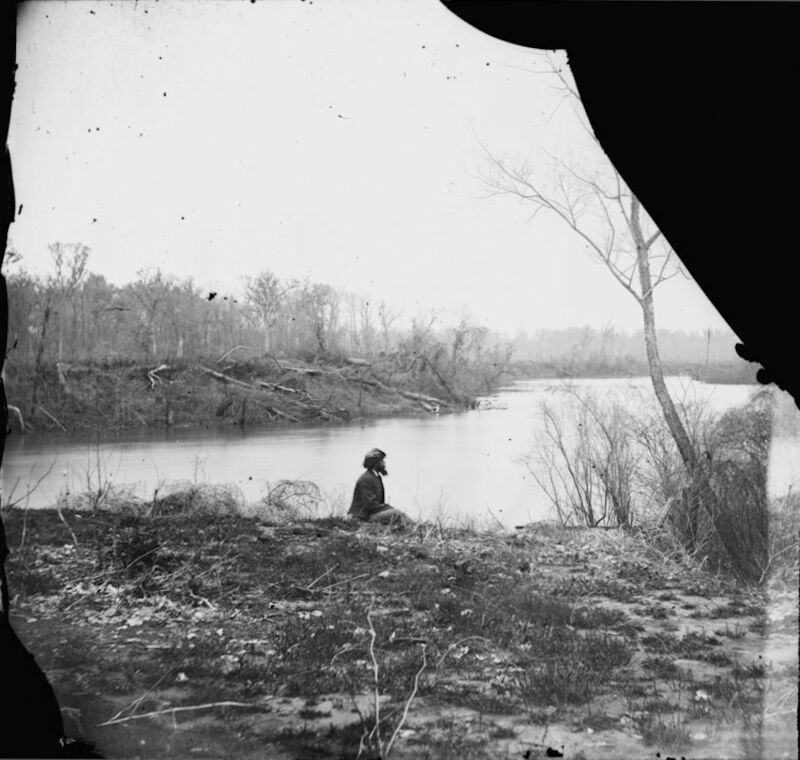 Image of Chickasaw Bayou taken some time after the battle. Exact location on bayou unknown, individual unknown.